Do you suffer from excessive menstrual periods? Do you sometimes have to change pads or tampons every hour, or have flooding periods that soil your clothing, causing you to miss work or other activities? There is a solution. Dr. Montgomery has been performing endometrial ablation procedures since 1991, with unsurpassed results. He was first in the Cy-Fair area to perform this procedure and has performed more ablations than any other ob-gyn in the Cy-Fair area. Dr. Montgomery also was the first in this area to use the new NOVASURE device to perform ablations, and has the most experience with NOVASURE. 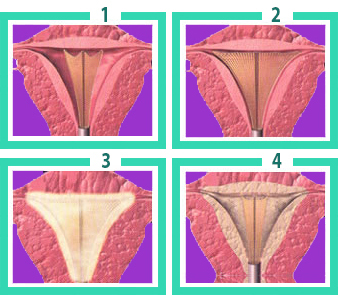 NOVASURE is an outpatient procedure to eliminate heavy menses. Recovery is minimal, with return to normal activity in 1-2 days. No incisions are required. Dr. Montgomery has developed modifications to his NOVASURE technique that have improved his results significantly over the manufacturer’s published results. Over 90% of our patients will experience NO subsequent period, or 1-2 days of light spotting. We call this NOVASURE PLUS. You may have seen the national TV advertisements about NOVASURE. For more information call our office at 281-955-5300. After slightly dilating your cervix and inserting a slender wand, Dr. Montgomery will extend a triangular mesh device into your uterus.